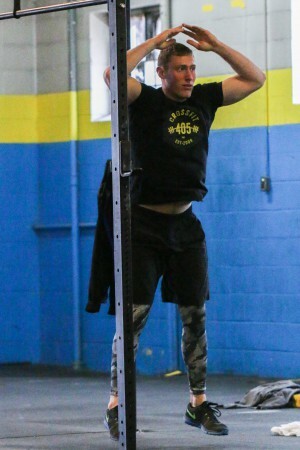 I’ve been a CrossFitter for over three years, and the majority of my time has been spent at CrossFit 405, a CrossFit gym near downtown Oklahoma City. 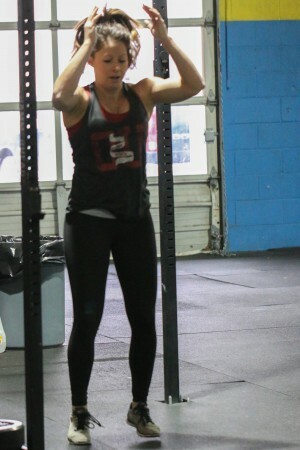 My local gym (or box, whatever you prefer) has been a place for me to push myself to my physical limits and get out of my comfort zone. I’ve done some pretty amazing things over the past three years that I didn’t think my body could do. In the process, I’ve gotten a lot stronger, both mentally and physically. 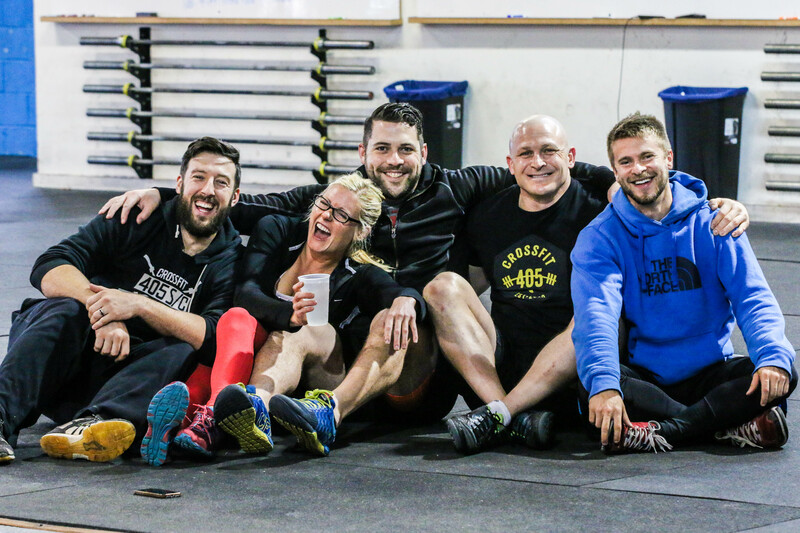 I’m still on the journey to becoming healthier, and that journey has been much more enjoyable with the gym family I’ve made at CrossFit 405. 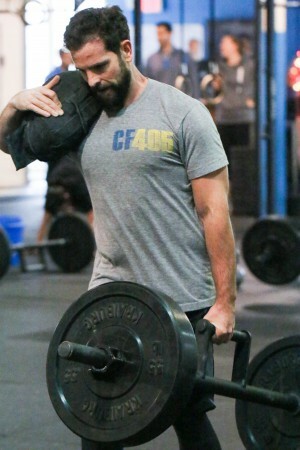 200ft single farmers (Rx135lb/95lb) and sandbag (Rx 75lb) carry. While one partner did the farmers carry, the other partner did burpees. 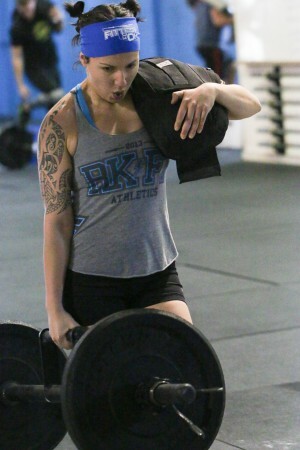 Each burpee shaved a second of the total time for the farmers carry. The anniversary party included some smaller challenges, as well as time for people to just hang out and chow down some tasty grub (because CrossFitters like to put food away!). Many of my friends at CrossFit 405 are happy to help me taste test my recipes before I post them on the blog. They always give me their honest feedback (whether I like it or not), and help me step up my game so that I make sure and share recipes with you that make your taste buds happy. My recipe for Chocolate Hazelnut-Almond Spread got a big thumbs-up from my CrossFit 405 taste testers. Since I made several test batches to perfect the recipes, there was plenty to share! The spread is reminiscent of nutella, although it has a much cleaner profile. Several of my taste testers reported eating the Chocolate Hazelnut-Almond Spread straight out of the jar! 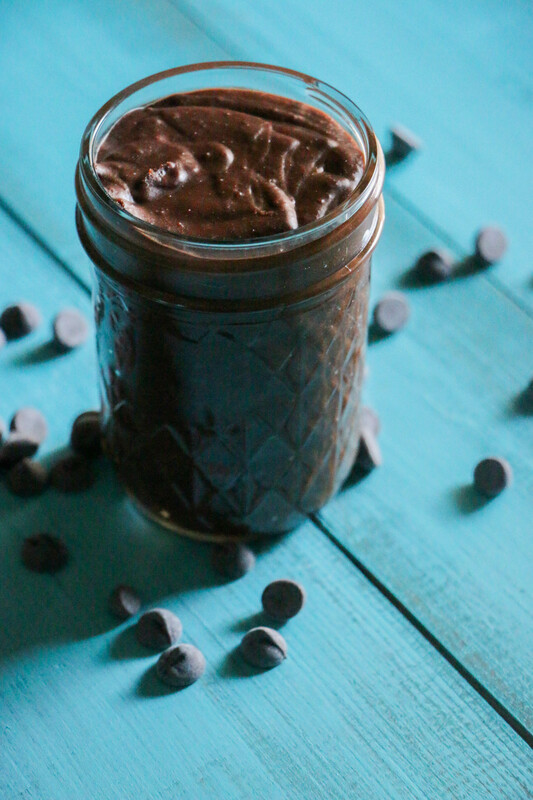 The Chocolate Hazelnut-Almond Spread is very versatile treat. You can use it as a fruit dip for guests, or eat it with Paleo/Gluten-Free pancakes or waffles during a weekend brunch. 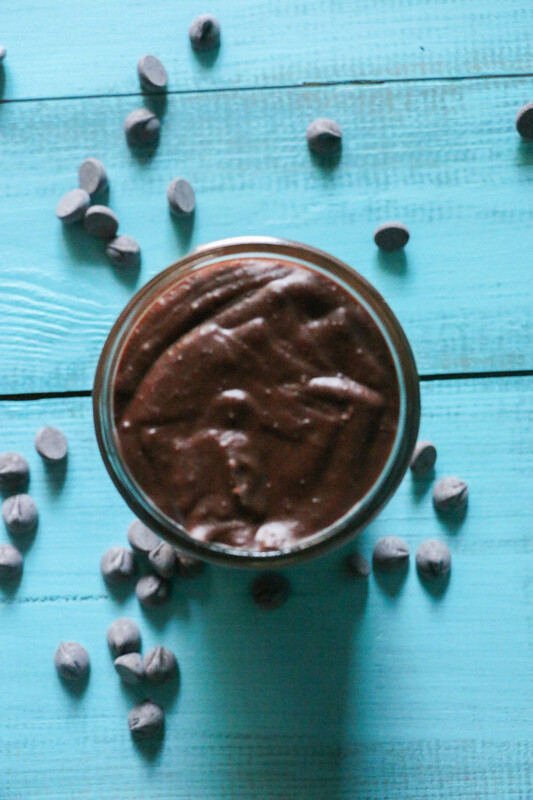 I used the Chocolate Hazelnut-Almond Spread as the base for another recipe, which I will be sharing with you in my next blog post (so make sure to check back next week)! Do you CrossFit? If so, I’d love to hear about your CrossFIt community. Are there any other workout styles you love? Feel free to share about what workouts make your body feel better in the comments below! On a baking sheet lined with parchment paper, spread the hazelnuts and almonds in a single layer (making sure to keep the different nuts separate) and roast for 12-13 minutes, stirring them at the half way point during the roasting process. Remove the hazelnuts and almonds from the oven and set aside to cool. Once the nuts have cooled, place the hazelnuts in a cloth napkin and rub together in the napkin to remove some of the skin (note that some skin will still remain on the hazelnuts no matter how much you rub, which is ok). 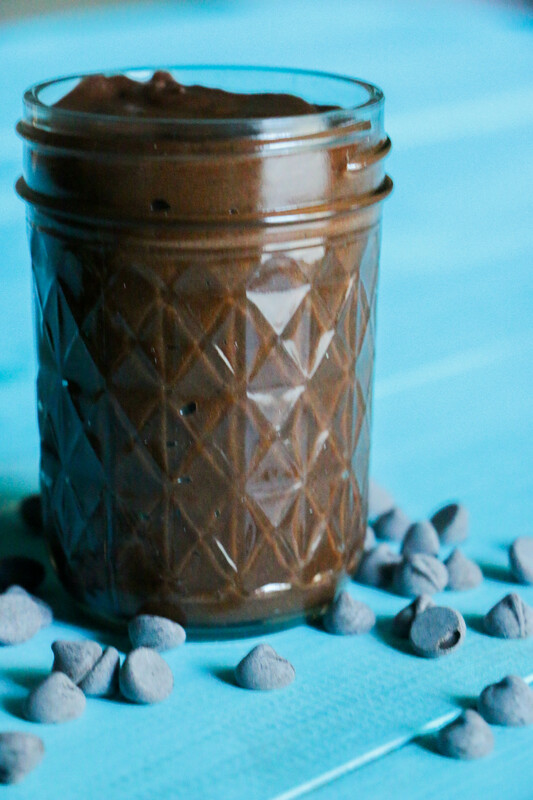 Pour the dark chocolate chips in a microwave safe bowl. Place the bowl in the microwave, and heat on high for 25-30 seconds. Remove bowl from the microwave and stir the dark chocolate chips. Place the bowl back in the microwave and heat an additional 25-30 seconds. Continuing the process of heating and stirring the dark chocolate chips until the dark chocolate chips have melted completely. Pour the roasted hazelnuts and almonds into the bowl of a high powered food processor. Blend nuts in the food processor on high until the nuts turn into a thick paste, which should take 2-4 minutes (depending on the power of your blender). Add the remaining ingredients to the food processor, and continue to blend another 2-3 minutes until the ingredients have fully incorporated and the mixture is smooth and creamy. Store in an airtight container in the refrigerator for up to 2-3 weeks. Tags: clean eating, crossfit, crossfit community, Gluten-Free, grain-free, nutella, paleo, paleo desserts, paleo treats, Primal | Permalink.